The Malagasy rainbow frog (Scaphiophryne gottlebei) may well be the most decorated of all Madagascan frogs, hence why it is also known as the painted burrowing frog. With its unique black, white red and green pattern this species is found in the rocky canyons of the Isalo Massif, in Isalo National Park. This extraordinary species is surprisingly well adapted to burrowing as well as rock climbing. Being able to climb allows the species to escape flash floods. To do this frog is equipped with wide, adhesive discs on the fore feet for clinging to vertical canyon walls. The fingers have “claw-like” structures, which are actually a highly prehensile tip of each digit with horny skin that improves grip during climbing. When it comes to digging frog has large shovel-shaped horny tubercles (wart-like swellings) on the underside of the hind feet to help with burrowing. But since in life you can’t have it all they are not so great at swimming with their short legs and only webbed hind feet. Malagasy rainbow frogs breed in temporary rock pools and their tadpoles develop quickly (in 1-2 months) to avoid being washed away by sudden heavy rains. Unfortunately its beautifully decorated skin may be one of this species’ downfalls; it is threatened by over collection for the pet trade. Other factors that threaten this species are habitat destruction, caused by fire, wood extraction, overgrazing by livestock, and recent sapphire mining activities in areas adjacent to the species’ known range. 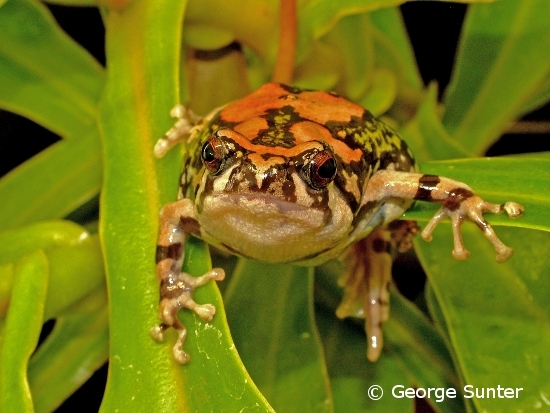 Help EDGE save species like the Malagasy rainbow frog become an EDGE champion!